How does our small cell bee defend herself against the Varroa mites? 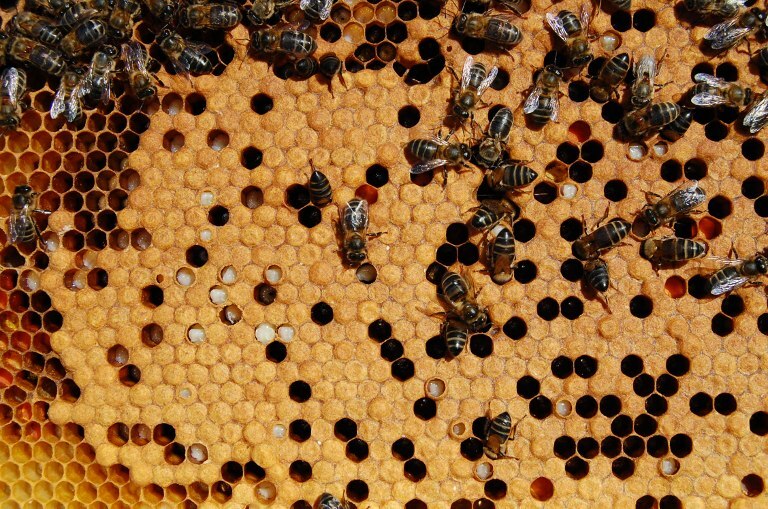 Does the drone brood act as a Varroa trap in small cell bees? As I said within our small cell bees the varroa focuses on the drone brood throughout the summer, apparently in contrast to the previous experience with the large cell bees. 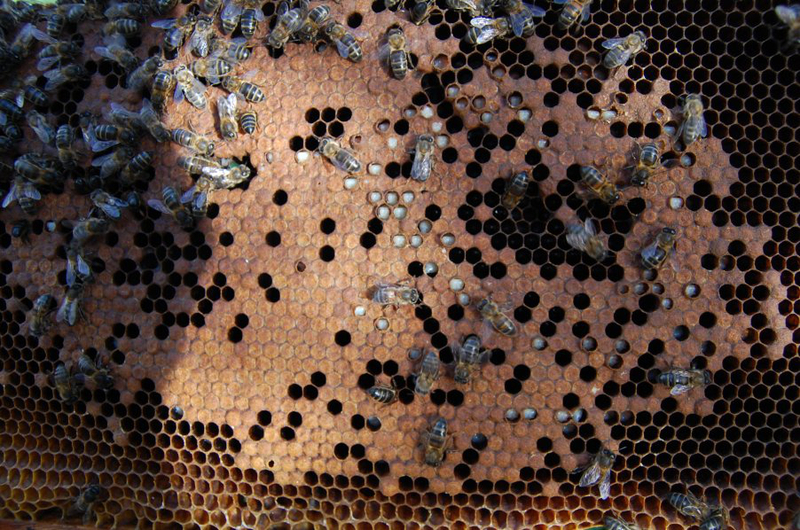 The Varroa comes from the Asian bee cerana, which also builds small cells, and there the mites have also always been focused on the drones. We brought the varroa to us and our bees have been artificially enlarged so that the Varroa confused them with the drone brood. Dee Lusby calls this the pseudo-drone effect. On the photo you can see some already cleaned cells, some where the mites have been on the head and some where they already started to eat the larvae in order to reach the mites. If we see something like this in our colonies, we can consider ourselves lucky. If the mite is sitting at the head of the larva, it is removed and the bee does not die, but hatches normally. But if the mites are in the bottom of the cell, the bees have to eat their own brood. This can at times take on enormous proportions. And it is now visible how each colony that defends itself has to go through a crisis. What weakens it most is that it decimates itself. I can find also increasingly bald headed brood amongst the drone brood, throughout the year. Dee explained that the "hygienic behavior" has to do with the division of labor within the hive. If there are many bees they can subdivide the work better and also find it necessary to kick out the mites. This apparently requires a trigger, because at a certain stage it leaves them pretty untouched. Taking in account that the small cell bees have a longer life span (8-12 weeks), it is clear that this hygienic behavior is more common in the small cell hives. Now it is not so important how many varroa mites are in the hive. It depends on whether the bees defend themselves and how resistant they are to the virus of deformed wings DWV, which is an absolutely fatal disease. If during an inspection, at the beginning stage of the transition to small cells, we find more than 5 bees with deformed wings, we must act; otherwise the colony will soon be lost. Last year I made a good experience by simply replacing the Queen with a new Queen bred by certain criterias, I was able to solve the problem. But you can’t find that at the beginning. At first we had to do a shakedown on new foundations and then change the queens. This year it has stabilized even more in spite of some deformed bees the problematic hives were able to recover. For the selection and breeding of queens more later - this is enormously important. With the tweezers, one varroa is placed on the entrance board.